Agricultural FARM, 50.000 m2 1st category workable terrain! European Funding! Location! Location! Location! 100 acres with road frontage on the Mtn. Pine Ridge Rd. (the road to Pacbitun and Carocol Mayan Ruins),just 6 mi. off the Western Hwy. 30x40 ft. elevated hardwood cabin (with verandah running the full 40 ft. across the front of the cabin) and dry storage underneath includes Perkins Diesel Kohler Generator,300 & 2,000 gal. water tanks. It was once a flourishing family farm that has since been left stagnant. It was a thriving cattle ranch with citrus trees and coconut trees. This is a very nice home with large gardens in Lake AtitlÃ¡n. The property itself has about 3.5 acres. Half of the land is a garden, and the other half is a coffee plantation. The property has itÂ´s own road access, front gate, and internal road to transit to/from the lakeside. Finca Bosque is situated on Lake Atitlan, one of the most beautiful lakes in the world. It is a haven of beauty and peace set in landscaped tropical gardens beneath a canopy of tall trees. The property, in the Western Highlands of Guatemala, is at the western end of the lake between San Pablo and San Juan and directly opposite San Pedro. Lake Atitlan Home with huge lot appoximately 240,000 square feet about 6 acres of land on the out skirts of rapidly devoloping Santiago Atitlan. Death in family forces sale at bargain price. Lake Atitlan considered one of the most beautiful lakes in the world with its perfect climate, lake and volcano views. This incredibly beautiful property is located less than 20 minutes from Granada but is in a world all its own. This property was formerly a working ranch with cattle, sheep and horses. There are barns and stables as well as fenced and cross-fenced pastures. It has both city water and electricity with a paved road directly to the gate. 1400 Mz. ( 2352 acres ) Hacienda San Carlos Incredible ranch located on Lake Nicaragua, 2 km and 130 acres of Lake frontage., spectacular views of Ometepe Island and its two volcanos. 2200 acres of grazing land, 420 acres planted in sorghum. Property is straddled by Pan Am Highway. Main ranch house is ultra-modern, 3 bedrooms, 2 bathrooms, pristine views of the lake, wonderful tropical garden. Property in beautiful rolling hills of northumberland county (Ontario, Canada) about 10 miles north of lake Ontario 37 plus acres of farmland, bush and with lots of wildlife .. Deep well treed ravine runs through the property and a small stream House built in late 1970's is brick and has three bedrooms large country kitchen and large garage (2 car) with remote garage door opener. Located in a very peaceful rural setting just 35 minutes east of Kamloops, an excellent 600 acre farm comprised of 6 titles, irrigation rights, 230 head range permit, 1000 acre lease, 104 year old 2 storey 6 bedroom heritage log home, and numerous outbuildings. Admirable farmland with good hayfields, pasture land, and Robbins creek running throughout. This 703 acre Ranch located outside of Clinton, British Columbia boasts private stocked lakes, mountain views, multiple homes, over 10 outbuildings (many with electrical and insulated), and a private airstrip. The Ranch is completely fenced and set up as an efficient cow-calf operation. The Tower Ranch main residence is a newly constructed 2800 sq. ft. masterpiece. Located 16 miles North of Kimberley British Columbia and spanning 320 acres of rugged landscape in the majestic British Columbia Rocky Mountains, Cherry Creek Estate is one of the rare estate properties available in this wilderness area. Location: The property is located approximately 30 minutes N of Fernie Alpine Ski Resort and 1 hour from the USA/Canadian border. Calgary, Alberta is just 3 hours NE of the ranch with commercial airlines and Cranbrook, BC is only 1.5 hours to the W with commercial flights as well. 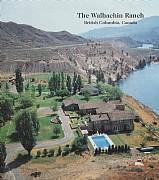 Established 65 acre horse breeding and event facility located in British Columbia Canada. 110â€™ x 320â€™ heated indoor arena, set up for any event. 100â€™ x 200â€™ outdoor arena. Round pen, 120 stalls, full breeding lab, stallion turn outs, cattle feed lot, restaurant, offices, suites for hired help, 5 large pastures, over 30 turn out pens and loads of extras. Whether you are looking for a private retreat, a horse ranch, a place to build a tourism oriented business like a Guest Ranch, a Bed and Breakfast and RV - Park or you are just interested in an investment opportunity you might have found the right place. The property, a 55 ha Ranch, is big enough to accomodate whatever dream you are trying to realize. Opened in 1989 this Rainbow Trout U-Catch has been recognized as the premier trout farm in British Columbia. This U-Catch boasts the largest Rainbow Trout in any U-Catch in BC. We cater to all people. We frequently host business tournaments, guide or scout groups, church outings and birthday parties. We have had 150 people at a time using our facility although not all fished at the same time. Riverlands is an incredible opportunity to acquire over 1,200 acres of pristine land within 25 minutes of the world famous Whistler Resort. Spanning the entire Pemberton Valley, the Riverlands portfolio is surrounded by snowcapped peaks, lush green farmland, dense forest and includes approximately 10 kilometers of riverfrontage on two rivers. Built in 1961 at a cost of 1.5 million dollars, the house features 2500 tonnes (est.) of extensive stonework, and is constructed entirely with cedar panabode notched logs. The house features 5 fireplaces, an indoor fishpond and vaulted Cedar ceilings. This beautiful 29.08 acre property backs on to the South Alouette River. A 24' wide private paved drive takes you to a 2448 sq. ft, 2 story, 4 bedroom, 2 bath principle residence. Ample parking with a detached garage for 4 cars. A manure shed, a 3800 sq. ft barn with horse stalls and a 850 sq. ft caretakers residence complete the package. If you are looking for privacy,silence and solitude within easy drive of a vibrant city, this is the place for you. Located 1 1/2 hours from Calgary, this unique property (320 acres/129 hectares)in the Porcupine Hills of SW Alberta has its own access road, is located in a private valley, and is surrounded on three sides by Government Lease Land where no one else can build. Organic 90 Acres Farm Directly On The Beach! Organic Farm With Multiple Commercial Potential! stunning Northumberland Strait and the Confederation Bridge. Forest - Heaven - Lumber... - Too Good To Be Cut! This is the best deal in the area... touristic land at ranch prices. Fishermen's paradise, cristal clear waters, wildlife, please visit the website for complete details. Enjoy Careyes and Puerto Vallarta's proximity for a fraction of the cost. Lots available from 50 Acres for US$120,000 in front of Cajon de PeÃ±as lake. Beautiful Estate In San Quintin Bay Area! Reduced Price! Family owned estate in San Quintin Bay. This home is ideal for either a vacation home, bed & breakfast, personal retirement home, or even a tour resort for motorcross/surf & fishing expeditions. This estate neighbors a beautiful childrens park which also neighbors one of the most beautiful restaurants in Northern Baja California, JARDINES BAJA.